Meridian Prime Headphone Amplifier review | What Hi-Fi? 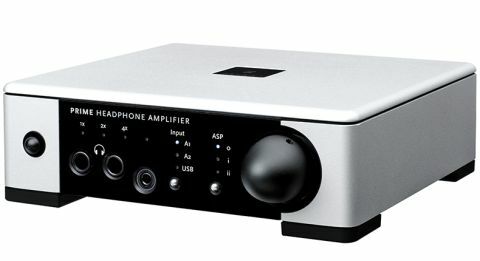 The name of the Prime Headphone Amplifier makes its intended purpose clear. It has built-in digital-to-analogue circuitry, but we get the feeling most of the effort has gone into the analogue amplification stages. It has no fewer than three headphone outputs: two 6.3mm and one 3.5mm option. It’s happy to drive multiple headphones, but we find the sound is a little better defined when just one pair is driven. Meridian is a master at signal processing, so it’s no surprise to find ‘Analogue Spatial Processing’ on board the Prime. It’s a function designed to counteract the fact that stereo recordings are designed to be played over speakers, not headphones. ASP blends the left and right channels to varying degrees – there are three options – to try to create a more natural presentation. These features can often compromise clarity and focus to improve sound staging, but ASP sounds pretty convincing. This is a small, beautifully built unit. We’re not totally taken with the display, though. The three indicators represent a range of source sampling rates, from 44.1kHz up to 24-bit/192kHz. We’d like a more informative display showing both bit depth and sampling rate. We start by connecting the Prime to our Mac laptop. We use a variety of headphones, and the results put us in mind of Meridian’s £450 Director DAC in terms of character, though at a higher level when it comes to sound quality. The tonal balance is nicely judged and the Prime never sounds flustered or rushed. It’s totally in control – perhaps a bit too much, as some of the excitement is tempered. Dynamic punch and rhythmic drive are reined in a touch, too. It’s when we try the line-level inputs that we’re surprised. Through the analogue inputs the Prime sounds more entertaining. Rhythmically it’s more forceful, and there’s plenty of punch with music as diverse as Adele’s 19 and Metallica’s Enter Sandman. All the insight and composure we noticed through the USB input is still present, but there’s more spice to the sound. The Prime also works well as a dedicated stereo preamp. It’s certainly right up there with some of the best preamps we’ve heard at around the £1000 mark. We were worried Meridian had been too ambitious in its pricing – if this were only a DAC we’d mark it down because of that high price. But this is a supremely capable headphone amplifier and also a fine, if slightly feature-limited, stereo preamp. And that is enough for the full five stars – treat the DAC as a nice bonus.